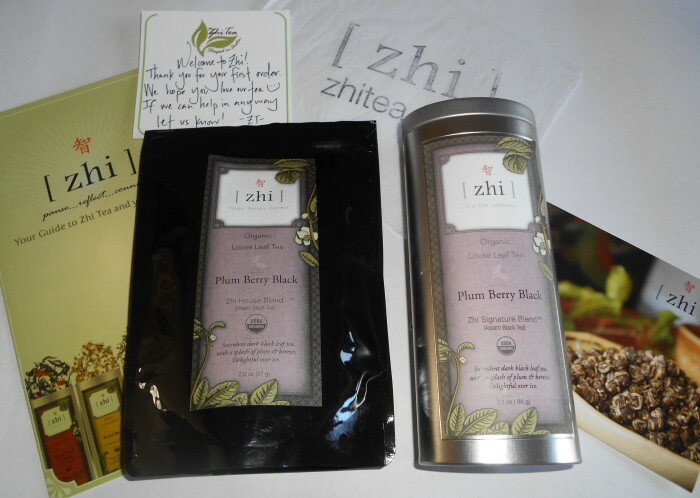 Today we’re reviewing Plumberry Black Tea from Zhi Tea out of Austin. First of all let me comment on their packaging. This is what arrived in the mail. A lovely thank you note, a brochure on tea, a postcard promoting another tea, the stamped tissue and also a note and stamp on the invoice along with lovely packaging and labeling. Over the years, I’ve developed an appreciation for good marketing and excellent customer service. This company has all of the elements of success in place. Based on what I received, I believe they sincerely appreciate their customers and are attentive to details. The little touches created a more personalized experience out of an impersonal internet order. Delta Airlines could learn a lot from these folks! 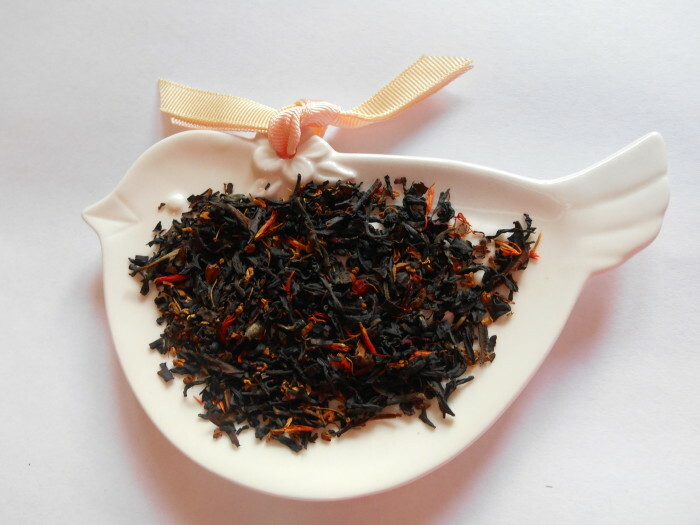 Plumberry Black tea is a blend of organic Assam black tea, hibiscus, osthmanthus petals, safflowers, and natural plum and berry flavors. The Osmanthus is also called a Tea Olive. You may have this bush with its tiny, very fragrant flowers in your own garden. You can collect the flowers and add them to your tea, if you like, for a powerful, floral, fruity scent. 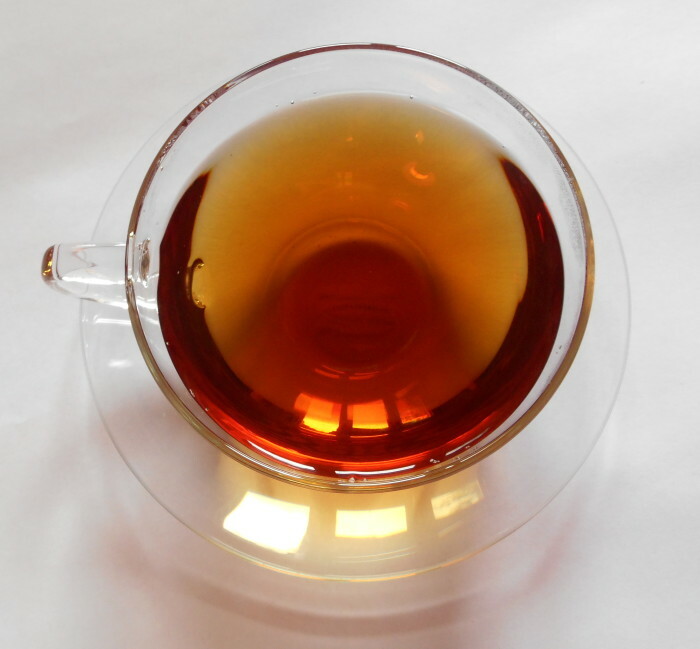 It also has a scent similar to plums so it is a nice contributor to the flavor of this tea. As an herb, it is said to be an appetite suppressant and rich in vitamin B3. Osmanthus was originally grown in China and is commonly used in teas and Asian cooking. You can see red safflower petals making for an attractive mix. Even though I don’t normally add sweeteners to my tea, this tea benefits from the addition of sugar or honey. I found that the sugar made for a smoother drink. The bold taste of plums in this black tea is strong enough to pair with dark chocolate and that is an ideal way, if you ask me, to add sweetness.